We are pleased to inform, that as a member of I.S.E.S. 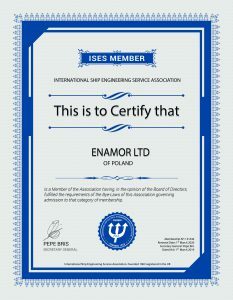 – International Ship Engineering Service Association, Enamor Ltd., has obtained the relevant Certificate of Membership in the Association. The purpose of the Association, which currently has more than 50 members in 25 countries, is to develop a common strategy for effective, alternative and independent provision of navigation and communication services, electronics and electrical services, specialized mechanical services and consultancy and project management for shipowners and over 150 ports all over the world.